Brunch is a late morning meal between breakfast and lunch, as a replacement for both meals, usually eaten when one rises too late to eat breakfast, or as a specially-planned meal. The term is a portmanteau of breakfast and lunch. While common in the United States, unlike "tiffin", the term originated in 1896 as British student slang (as cited in Punch magazine). Brunch can be served after a morning event or prior to an afternoon one, such as a wedding or sporting event. It is usually a more relaxed meal than breakfast or lunch, and considered appropriate for informal celebrations. One episode of The Simpsons famously described brunch this way: "It's not quite breakfast, it's not quite lunch, but it comes with a slice of cantaloupe at the end. You don't get completely what you get at breakfast, but you get a good meal." Some restaurants and hotels serve brunch, especially on weekends and holidays. 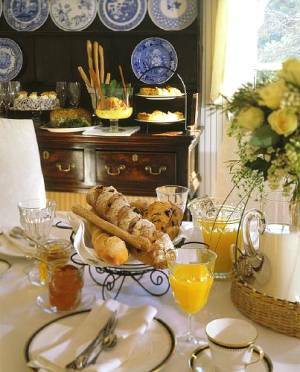 Such brunches are often serve-yourself buffets, but menu-ordered meals may be available instead of, or with, the buffet. The meal usually involves standard breakfast foods such as eggs, pancakes, sausages, bacon, ham, fruits, pastries, and the like. However, it can include almost any other type of food served throughout the day. Buffets may have large roasts of meat or poultry, cold seafood like shrimp and smoked fish, salads, soups, vegetable dishes, many types of breadstuffs, and desserts of all sorts. The dim sum brunch is a popular meal in Chinese restaurants world-wide. It consists of a wide variety of stuffed bao (buns), dumplings, and other savory or sweet food items which have been steamed, deep-fried, or baked. Customers select what they want from passing carts, as the kitchen continuously produces and sends out more freshly prepared dishes. Brunch meals are one of the offerings made by restaurants and diners as special occasion meals during holidays such as Valentine's or Mother's Day. It is not uncommon for these holiday brunch services to require advance reservations; and the restaurant features special pricing and themed dining selections on its brunch menu. Restaurants that cater to the brunch subculture may offer brunch as late as 5 p.m. on weekends, though cutoff times between 2 and 3 p.m. are more common. Holding the special brunch during a holiday, e.g. "Mother's Day Brunch" or "Valentines Day Brunch" where restaurant and food are themed for the holiday. Offering alcoholic beverages during the meal, a “Champagne Brunch”, which establishes a distinction between breakfast where it is uncommon to serve alcohol. The brunches which will appear most distinct to a customer are those served at restaurants that are slightly eccentric or premium to begin with, which is to say that you can't repurpose the cream and chocolate drizzles from your gourmet desserts to your pancakes if you don't have gourmet desserts to begin with. Having brunch with friends and family is one of the most enjoyable activities. Brunch is easy and fun, and it provides a great opportunity to slow down and enjoy life with the people you love. 1. Pick a date and time. Sundays are usually the best brunch days, but any day is appropriate. 2. Invite some friends and/or family members. A phone call or e-mail is sufficient for a casual brunch; send written invitations if the meal is celebrating something special. 3. Plan a menu that you'll enjoy preparing with dishes that are easy for you to make. Pancakes and fruit bowls with pastries, hash browns and quiches are good choices for larger groups of people. Eggs, bacon, omelettes and sausages are easily prepared for smaller numbers. 4. Shop the day before and prepare as much as possible ahead of time. Clean your house in advance as well. 5. Wake up early and prepare yourself for the arrival of your guests. If you can prepare certain dishes at this time (pastries, for example), do so. 6. Set the table or buffet table if serving a buffet brunch, and decorate it with fresh flowers. 7. Have coffee, soothing music and sunshine (if possible) ready for your guests. 8. For a lot of people brunch will be the first meal of the day and includes that all-important first cup of tea or coffee. Find out what they like - especially herbal or decaf - and have a supply on hand. They'll love you for it. 9. Greet each guest with enthusiasm and a welcoming smile. In your spare time, whip up the remaining dishes. 10. Serve your guests, then yourself. Then sit down and relax with your friends and family. Serve mimosas if you know your guests will drink them. Consider hosting a potluck brunch. Ask guests to bring a dish or a beverage. What wines to drink for Mother's Day brunch or any special brunch? The classic choice is Champagne or sparkling wine. In addition to being festive, the effervescence of sparkling wine stimulates the palate and creates a sense of lightness that is welcome early in the day (breakfast is probably not the time for big red wines!). Champagnes and other sparklers are also quite versatile with food, and are especially good with eggs, because of their palate-cleansing powers. For the same reasons, Champagne-based cocktails such as Mimosas and Kir Royales are also popular brunch drinks (and preferable to heavy, palate-coating Bloody Marys). For those who don't like Champagne, crisp, unoaked whites such as Muscadet, Pinot Grigio or most Sauvignon Blancs are reasonable substitutes. There is a more exciting alternative to Champagne, however: Moscato d'Asti from Italy's Piedmont region. This delicious wine is sweet, but never cloying, and lightly sparkling, or frizzante (it won't give you headaches). When fresh, it is meant to be drunk within a year of the vintage. It gives off effusive peach and apricot aromas and offers an appealing balance of sweetness and acidity that is perfect for the first meal of the day. As the wine writers Ed McCarthy and Mary Ewing-Mulligan have observed, Moscato is a great match with anything that goes with orange juice. Moscatos are also very low in alcohol, typically a mere 5.5%, which makes them perfect for brunch. Why not stop by your local wine shop and pick up a bottle, preferably from the 1999 vintage.